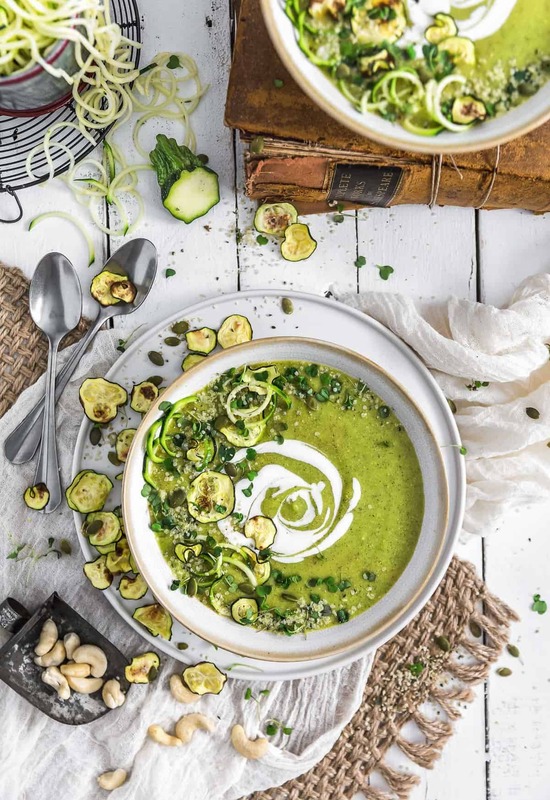 This ultra creamy and delicious Vegan Cheesy Zucchini Soup is a fabulous summertime dish. Zucchini is the star of the show making us wish zucchini was in season all year around! 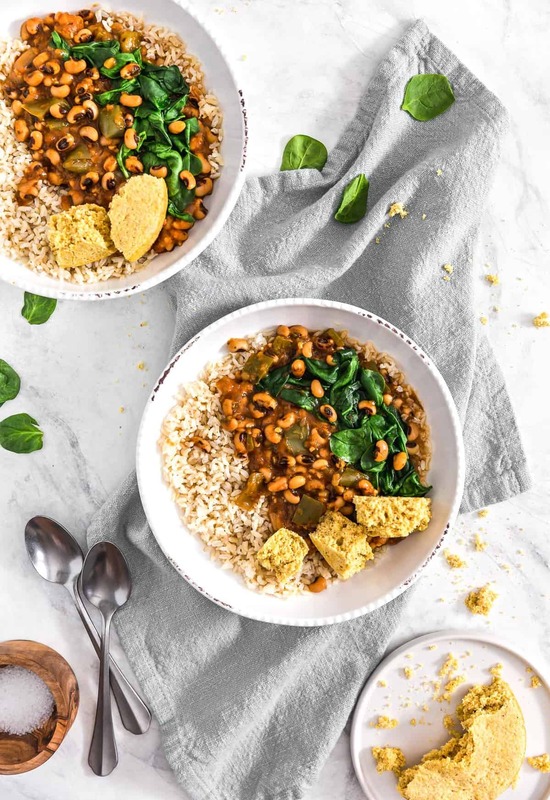 Cashews, veggie broth, plant milk, and nutritional yeast help create a rich, thick, and comforting soup! 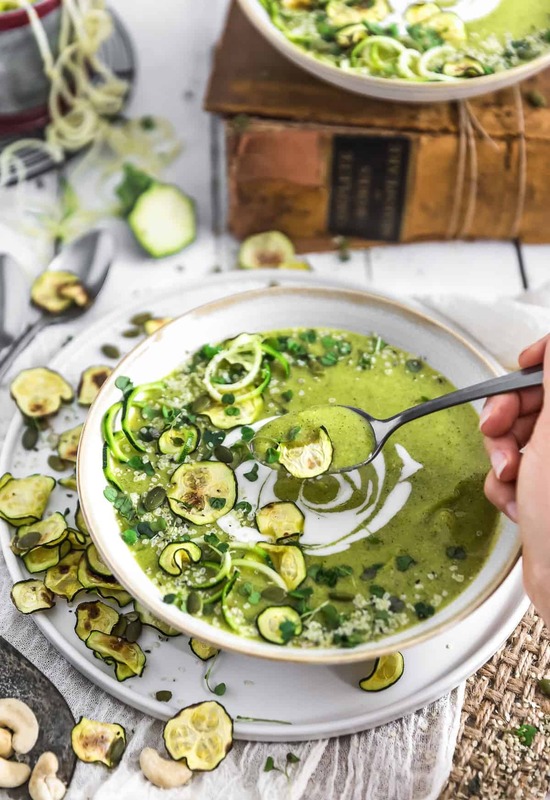 Packed full of wholesome zucchini and topped with fun zucchini chips, zoodles, hemp seeds, and pumpkin seeds, this healthy and super easy soup will have the whole family chowing down. 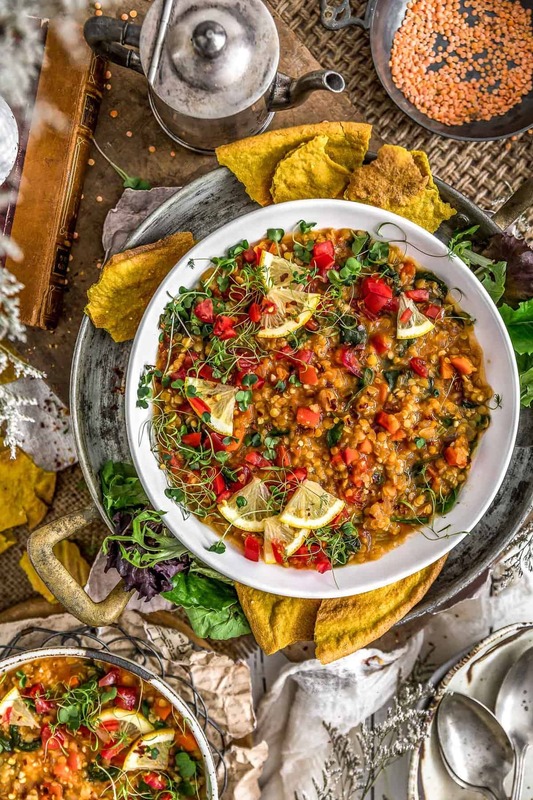 Whole Food Plant Based recipe, vegan, oil free, refined sugar free, gluten free, and no processed ingredients. Our garden has produced an overabundance of zucchini this year. Well, let’s be honest, every year we have an overabundance of zucchini. Zucchini is just one of those plants that just keeps giving and giving and giving. 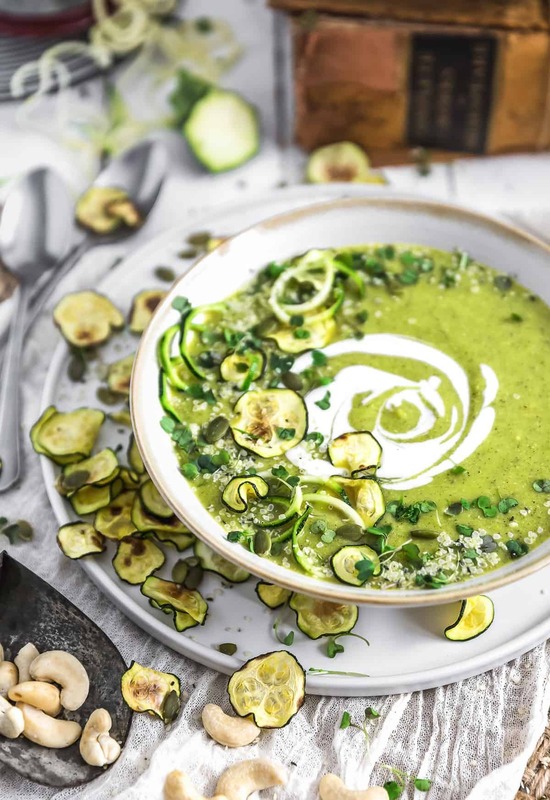 Not complaining for sure as our family loves zucchini, just trying to hustle up some zucchini recipes that are Whole Food Plant Based compliant that will be exceptionally tasty and healthy. What I love about this recipe is how fast it comes together. It is one of those meals that you can whip up fairly quickly. Once you got your zucchinis cubed, you are pretty much good to go and hit the ground running. You’ll be at the finish line in no time at all. If you have a large Ninja, Blend Tech, Vitamix, or similar high powered blender you can pretty much do one batch of pureeing the soup. We have a Nutri Ninja, which we love, and it took two batches. Just be careful putting hot liquids into a high-speed blender as they tend to spit lava at you once you unscrew the lid. I suggest putting a dishtowel over the top and then unscrew the lid, just to be extra careful. I loved topping this beautiful green goodness with some baked zucchini chips. Just preheat the oven to 425 F, line a baking sheet with parchment paper, and line up “single file” (no overlapping) very thinly sliced zucchini coins (very thin, but NOT see-through thin or they will disappear – LOL) on the parchment paper and bake for about 15 to 20 minutes. Watch them carefully as they turn quickly from not done to overdone in a flash, kinda like an avocado. I found this out the hard way. You can easily test how done they are by picking one up and if it is crispy, then they are done. Once out of the oven, sprinkle very very lightly with a tiny bit of sea salt. I have found if you sprinkle them with a tiny bit of sea salt before they go in the oven, the sea salt tends to be absorbed into the zucchini and overconcentrates so I sprinkle them as soon as they come out of the oven. I love our veggie zoodler. It is so much FUN to zoodle veggies. We placed a little bit of fresh zucchini zoodles on top of our soup right before serving. 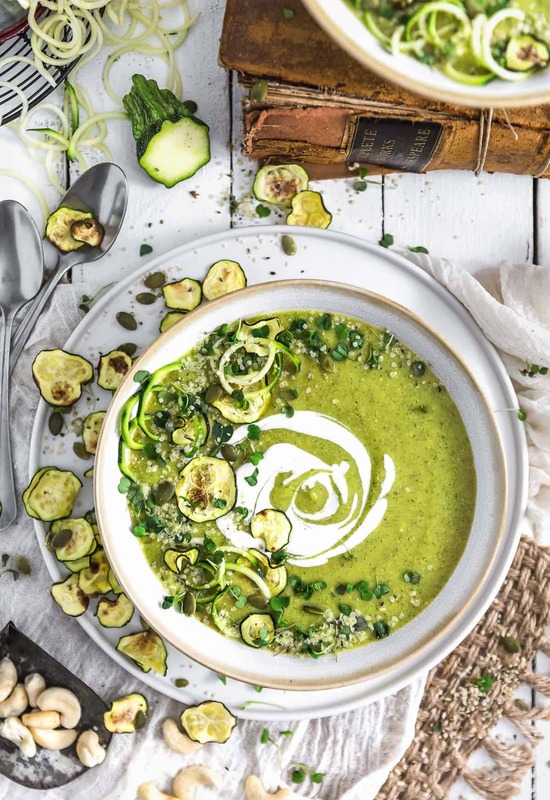 The hot soup sort of cooked the zucchini zoodles a tiny bit, creating this lovely texture to our soup. MMmmm! The lovely cream cheese rose in center of our soup was made very simply by taking a tablespoon of Kite Hill Cream Cheese (WFPB compliant) and adding a little bit of unsweetened plant milk at a time, and whisking them together until it was the mixture was thin enough to form a consistent steam of yummy goodness! Monkey then just spooned some on top of the soup in a circular swirl, then took a knife and cut through the swirl (in the same direction) a few times to create a cool pattern. Well done Monkey! 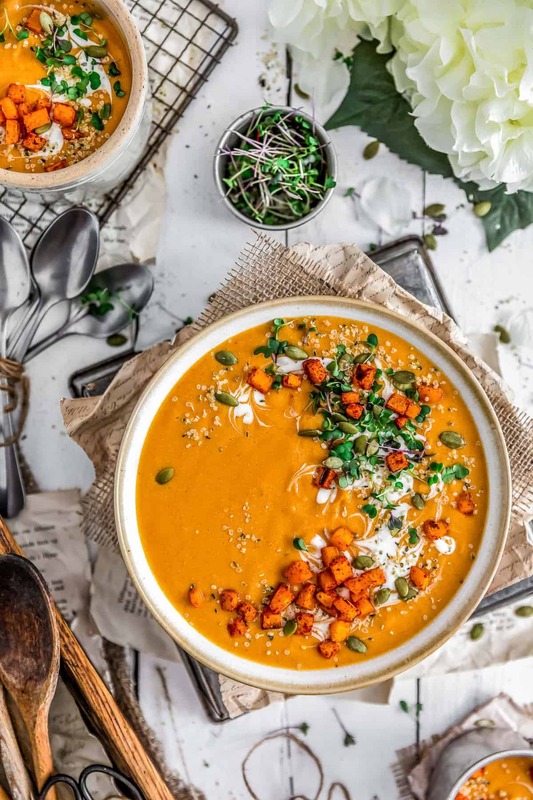 We then added a few microgreens, a tiny sprinkle of hemp seeds and pepitas/pumpkin seeds (all optional), but bring some healthy benefits to the table to create soup perfection! I absolutely adore this soup! It is soooo gosh-darn good! I am in love with this soup! It is so pretty, creamy, and hearty – all at the same time. The tiny sprinkling of zucchini chips and a little string of zucchini zoodles send it over the top, along with the vegan cream cheese, it adds another element of flavor to make it even more delicious than it already is. Seriously, deliciousness in a bowl. The ume plum vinegar adds another flavor element that is tasty, but you can substitute this for red wine vinegar if you wish. We just love testing out all types of vinegars as they are perfect for adding flavor to WFPB dishes. Plus, vinegar is so good for you as it can kill pathogens and some harmful bacteria in the gut. It also improves the insulin levels and reduces blood sugars. It helps lower cholesterol and improves heart health. Ume plum vinegar is known for its dramatic flavor. It is a Japanese vinegar made from pickled plums known to have remarkable medicinal qualities. It is excellent at removing toxins from the body, stimulating digestion, and neutralizing fatigue. We love it. If you have an abundance of zucchini from your garden this year, consider giving this beautiful recipe a try. We would love to hear from you! Prep the zucchini, then set aside. Over medium heat, add the chopped onions into an enamel/ceramic lined Dutch oven (or similarly large stock pot with a tight-fitting lid). Sauté for 5-7 minutes to soften. Then add the minced garlic and sauté for an additional minute. Add the cubed zucchini and sauté for a few minutes. Add all the remaining ingredients except the plant milk, nutritional yeast and thyme. Bring to a boil, then immediately lower to a simmer. Cover with a tight-fitting lid, then simmer for 20 minutes or until the zucchini is very tender. Remove from the heat and transfer the zucchini mixture into a high-speed blender and pulse until completely smooth, about one minute. You may have to do this in several batches. Please be very careful. Cover the high-speed blender with a thick tea towel to prevent burns when unscrewing the lid as the steam from the hot soup builds and can squirt out when you unscrew the lid. Transfer all the pureed soup back into the pot, then add the plant milk, nutritional yeast, and thyme. Stir and simmer for 5 minutes. After 5 minutes, taste the soup for seasonings and adjust accordingly to suit personal preferences. 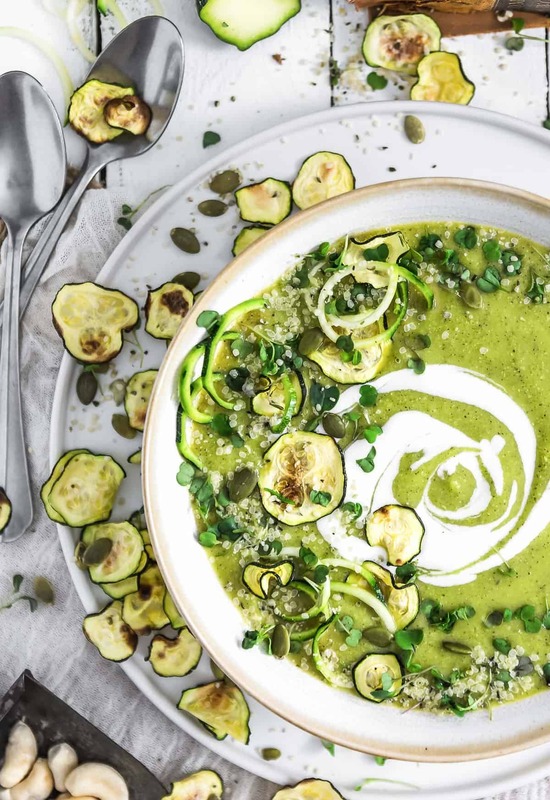 To serve, top with baked zucchini chips, fresh or steamed zucchini zoodles, vegan cream cheese (thinned with unsweetened plant milk), microgreens, and/or hemp seeds. *Zucchinis: Cut the zucchini into fourths lengthwise and remove the whitish pith and seeds before cutting into cubes. This (removing seeds and pith) will create a more flavorful soup as the seeds and pith can sometimes leave a bitter note. Leave the zucchini skins on. Measure the 6 cups after cubing the zucchini. The size of the zucchinis is relative. The first time we made it we used 6 medium zucchinis; the 2nd time, we used 5 – so the key is measuring out 6 cups after cubing for consistency purposes. *Cashews: You can add the cashews right into the soup, you do not need to create a separate cashew cream.